EMS Rope 7000 Series helps alleviate the detection problems often faced by utilities. Using breakthrough path marking technology from 3M, the new EMS Rope 7000 Series helps alleviate the detection problems often faced by utilities. The EMS Rope, which can be easily installed alongside underground pipes, continues to transmit a signal, even in the event of a cut or removal of a segment. 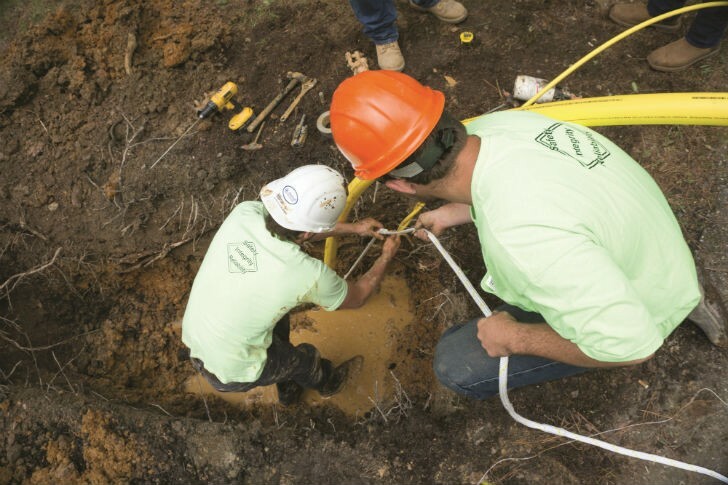 Compatible with pipeline installations up to four feet deep, the new EMS rope is available with a 200-pound tensile strength (skinny rope) for applications inside conduit, or a more rugged 500-pound tensile strength for direct bury and horizontal directional drilling applications. It has a long life expectancy, is corrosion-resistant and virtually maintenance free. The 3M path marking technology, available in both the EMS Rope Series and the EMS Caution Tape Series, was specifically developed to assist utility customers dealing with unreadable surface markers, bad or poorly marked facilities, unlocatable plastic pipes, and aging technology. The location system, which does not require a power source, identifies underground plastic pipes without installing access points. According to Ed Scott, business development manager of 3M Electrical Markets Division, the path marking technology used in both the EMS Rope and Caution Tape products is a game-changer for utility customers.